More than 80 families have moved into the complex and most units are rented out and that too majorly students. The reason being basic needs like CCTV cameras and utility shops are not there, preventing people from finally making a move in the near future. Maybe 2 to 3 years down the line you will see more people moving in. This is the view from one of the apartments at The Pavilion Court. There are 338 pages on IREF till date on the product, mostly negative but when you see this delivery you are bound to smile. Jaypee has done well for itself. 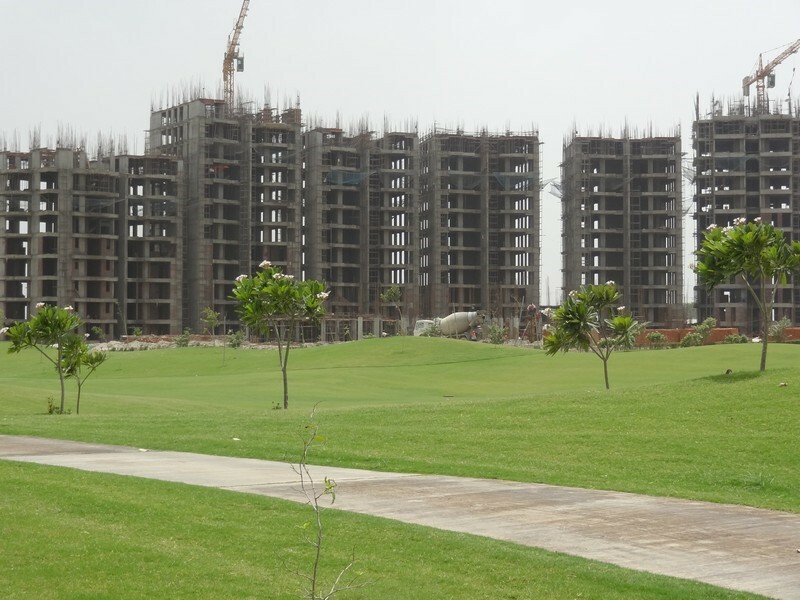 Jaypee Greens, located in Sector 128, Noida. It offers 1BHK, 2BHK and 3BHK apartments. 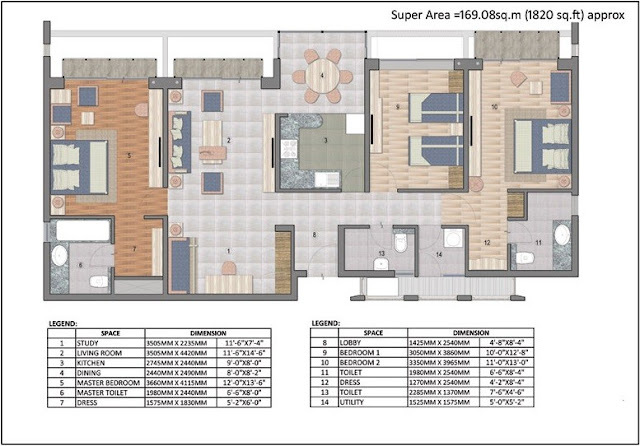 Pavilion Court is a lifestyle product which offers the host of value added features with generously proportioned spaces that emphasize on optimum space utilization and reflect stylish living. With 78 luxurious golf facing residences and every unit giving breathtaking views of the magnificent Graham Cooke signet course. The G+12 tower stands out with distinctive exterior finishes. Be a part of already thriving Pavilion community. Come, live the life. 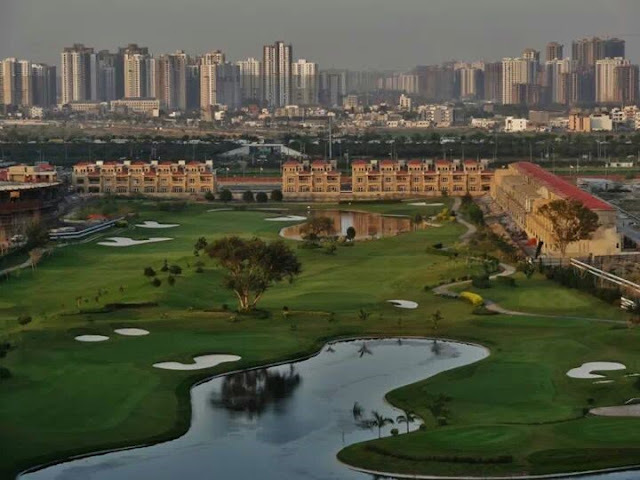 The Pavilion court at Noida is strategically located and offers the serene view of Nature and Golf. These are fully-finished, modern, hi-efficiency apartments. Thoughtfully designed, these Jaypee apartments size ranges from 1 BHK Studio Apartment with Study to 3 BHK Family Apartment with Study, thereby offering a wide range of units to choose from. The interiors follow the modern trend of open and continuous spaces and natural lighting with more windows making the apartments look larger and spacious. As a privileged resident of these apartments, one can enjoy the unsurpassed amenities of the Wish Town such as the 18 + 9 hole Graham Cooke designed signature golf facility, health and recreational facilities, Town Centre with facilities like art galleries, restaurants & cafes, high street retails, a wide range of educational facilities from kinder crib to pre-university levels and access to the International standard medical centre developed within the township itself. A symbol of modern day town planning, Noida is the fastest growing township in the National Capital Region, with international standard infrastructure. 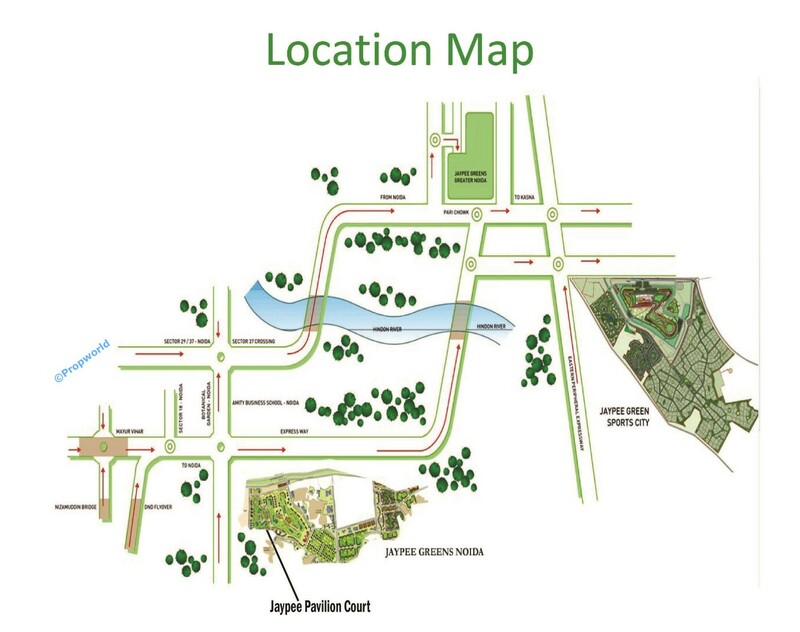 Jaypee Greens Noida is located 4 kms from the Amity intersection, thereby enjoying good connectivity and locational advantage with respect to the city master plan. The Pavilion Court is one of the residential development of Jaypee Greens, located in Sector 128, Noida, Noida Expressway (Uttar Pradesh). 1. Jaypee Pavilion Court is 25 minutes’ drive away from Connaught Place New Delhi. 2. Jaypee Greens Wish Town Pavilion Court is 20 minutes’ drive away from South Delhi. 3. Pavilion Court is 10 minutes from DND Flyway. 4. Pavilion Court is 45 minutes’ drive away from International Airport. 5. Sector 18 Market just 10 minutes’ drive away from Jaypee Pavilion Court. 7. 16 hospitals in the proximity as Yatharth Hospital, Dr. Mittals Medical Clinic. 9. 20 premium restaurants within the range as Subway, Café Coffee Day. 10. Located in proximity to Jaittpur Village and Ashram House bus stop. 11. 17 places for worship for all religions within the range of 3 km. 1BHK: These are spacious, well designed 1 BHK apartments. An entrance foyer leads you to the living room which is the highlight of the apartment. The bedroom is spacious and comes with a separate wardrobe space. The kitchen opens up into the dining area which is positive. The apartment has a vacation feel. 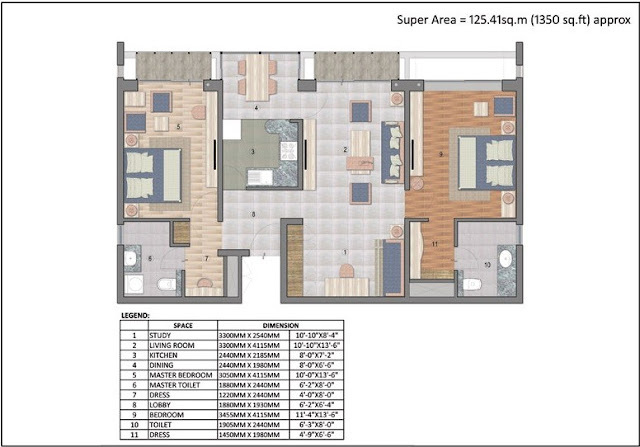 3BHK: The 3 BHK apartments are premium in nature. 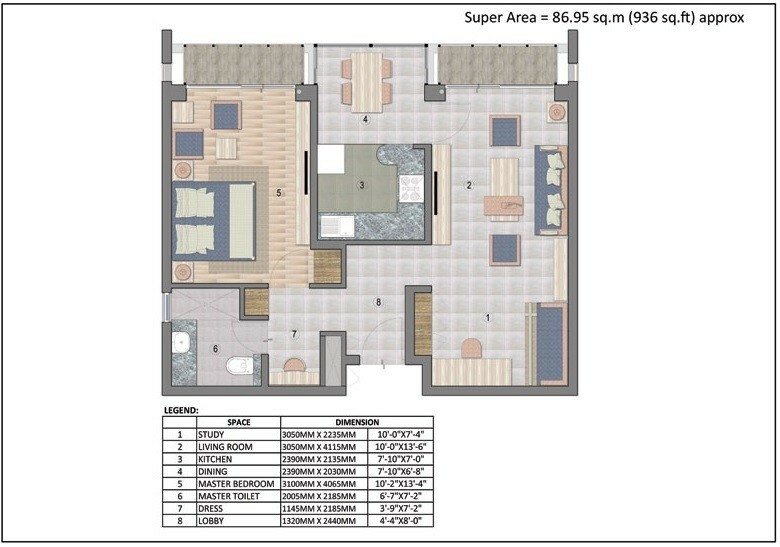 Based on a similar ‘H’ layout pattern where your living space is balanced out on both sides of the apartment. The apartment has a foyer which opens up into spacious bedrooms (I call them large in size in spite of the fact that the liveable area is 12*10 & 13*12 because there is a separate dresser which provides ample wardrobe). Again the dining space has been given privacy and is close to the kitchen which is a well thoughtful feature. 1. The layouts & space in the apartments. 2. Connectivity to Noida expressway. 3. Availability of Garden, swimming pool, play area, gym, rainwater harvesting, intercom, golf course and other luxury amenities. 5. Security 24 Hour manned security on entrance gates. 6. Water supply through underground supply lines/ overhead tanks. 7. Pari chowk which will have a metro station. 8. Surrounded by greens of the sports complex, stadium and parks. 1. The project is already going for four years of the span of time, so the main issue is delayed possession. These are vacation homes, premium quality apartments with all modern age facilities. These apartments have greater opportunity in terms of connectivity. Potential to become a great township, draw good rentals too having said that legal issue, delayed construction work, mismanagement by Jaypee are proving as major drawbacks. If Jaypee can sort out these issues it would be great!